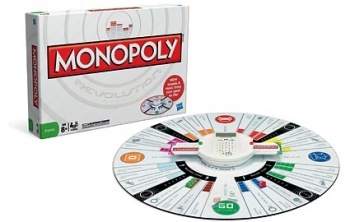 In honor of the classic board game's 75th anniversary, Hasbro announced a new version of Monopoly with a round board, an electronic banker and no way to cheat. Just look at it! The board is round! What kind of topsy turvy world are we living in? Once the only kid on the block, board games now make only a fraction of what videogames do ($920 million in 2004 compared to $7.3 billion that same year). Hasbro realizes that in order to stay competitive, it must innovate. It feels like Monopoly: Revolution Edition is trying to cater to a more digital culture by offering soundbites and ease of play. But is that really the answer? What makes Monopoly fun is the social aspect of the game and the house rules. Cheating isn't always fun but some players still do it and they won't be able to do so with this new version. One friend of mine is notorious for atypical trades like temporary immunity from rent for properties, cash or even sexual favors (It was a joke, I think). Will the social aspect be killed by this "game pod"? When was the last time you played the game without getting $500 from landing on Free Parking? That's not an official rule, but it's become the default way to speed up the game by introducing more currency. Will this Revolution allow house rules like that? I applaud Hasbro for trying to come up with new twists for board games. But I think they should try to design new games that incorporate these concepts instead of messing with the games in their library that are still fun. Monopoly has been around for 75 years. I think it works.